A couple months ago, we started to introduce dairy back into our diets. After being dairy free for over two years we decided to start with cheese and yogurt since all I've read says those tend to be easiest on dairy sensitive systems, next up is raw milk. Things have been going well and the little one even had her first legitimate ice cream cone from an ice cream parlor. Of course it had to be bluebell, loyal to my texan roots. Though my little toddler has had the time of her life eating string cheese and ice cream every so often, my body has not taken to eating dairy as flawlessly. It's possible that this dairy free business will become a permanent thing and I'm alright with that, especially when I have so many decadent dairy free indulgences to splurge on. This festive Valentine's day dessert is presented in two versions, a dairy version and a raw vegan version for those living without. I will be demonstrating the dairy version of this recipe saturday morning on Fox 13 news here in SLC. If you're awake around 8, be sure to watch me and my little belly (p.s. I'm pregnant). But then you're probably always awake and watching the news at 8AM on Saturday morning... right? Lay out the phyllo dough on a cutting board. Cut out as many heart shapes as you can, in groups of three. Cover the cut out hearts with saran wrap and a damp towel while you work. On a parchment lined cookie sheet, lay out hearts 1/4 inch close together. Brush with coconut oil, sprinkle with sugar, then top with another heart shaped phyllo sheet. Again brush more oil/butter on the top of the heart and sprinkle with sugar. Lay one last heart shaped phyllo sheet on top and sprinkle with sugar. Bake in preheated oven for about 5 minutes, watch them closely so they don't burn. When they are toasted and golden, transfer them to a cooling rack and cool completely. 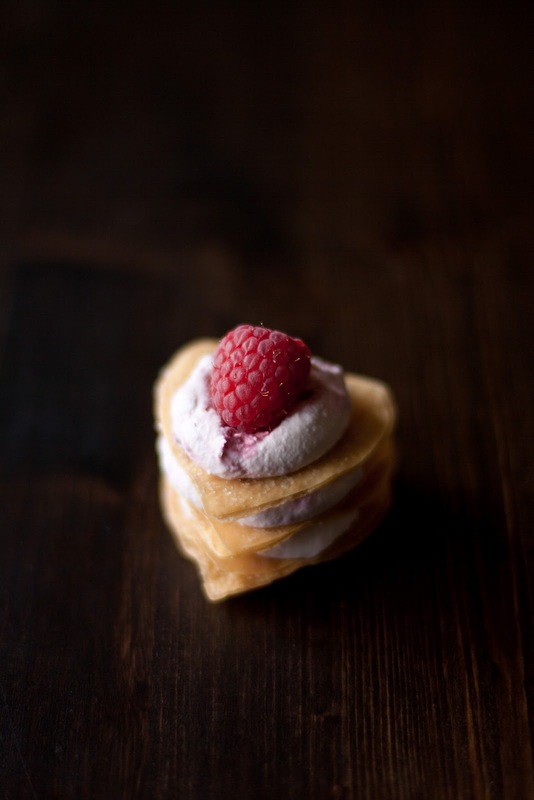 To assemble mille feuille, take a heart crisp and dallop with some raspberry cream. 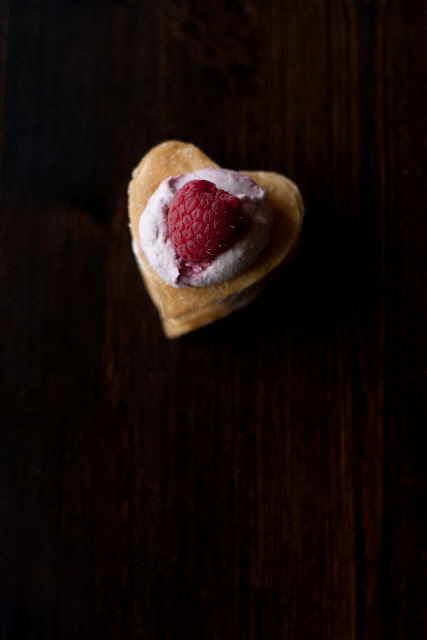 Put another heart crisp on top, and spoon another dallop of raspberry cream on top. Top with a third heart crisp, spoon a small dallop of cream on top, and garnish with a fresh raspberry. you can add an additional garnish chopped pistachios or grated chocolate. 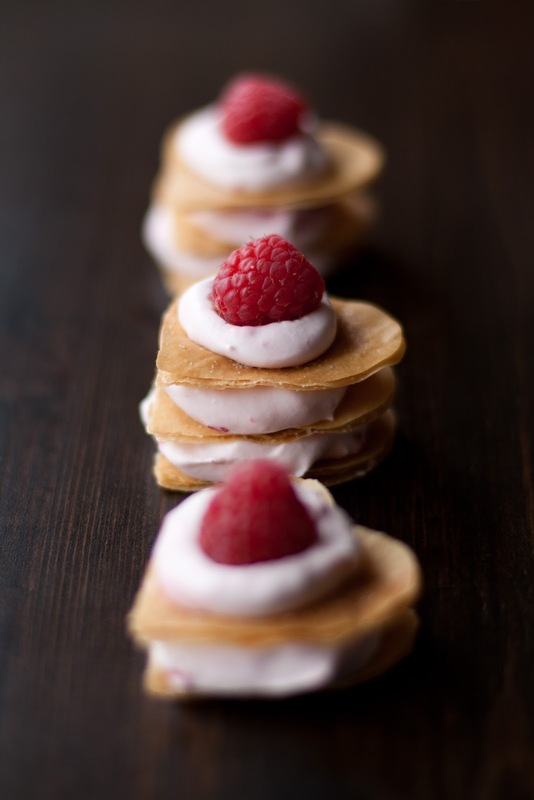 Prepare raspberry cream by whipping the cream until soft peaks form. Add the confectioners' sugar and a drop of vanilla extract until well mixed. With a spatula or wooden spoon, gently fold in the raspberries until well incorporated. In a high speed blender, combine all the ingredients save the coconut oil. Blend until very fine and thick. While the blender is running, slowly pour the coconut oil in a constant stream until it's completely incorporated. Taste the cream and adjust sweetener to preference. Transfer to a bowl or container, fold in the raspberries by hand, cover and refrigerate for at least an hour, until set. Whip it a little to fluff it up before assembling mille feuille. To make it easier and reduce dough waste, oil and sugar the phyllo sheets when they are whole, and after the third layer cut into small squares. In one of the layers of the phyllo dough, you can sprinkle a pistachio (or other nut), sugar, and spice mixture. p.s. the first photograph is the dairy version, the two others are the raw cashew cream version, if you were curious. Here;s the video clip of me on a local news station demonstrating the dessert. I failed to mention the dairy free version, and to actually show it but you get the idea..
this dessert is so beautiful, and simple. i actually have all those ingredients on hand... 2/14 might have some surprises for my darling love. Thank you sweet Lan! I was always shocked at the amount of products that had dairy and eggs in them. It was a lot more work making everything from scratch at home or doing without but it's rewarding in its own respect. Motion sickness pills with dairy?! That's crazy talk. I always thought it funny when vegan cheeses and dairy had milk derived proteins and sugars in them, wouldn't that make them mislabeled? Congrats on babe number two! And you are in the news? Fancy! Yay!! Congratulations on your growing little family. Can't wait to see another beautiful creation! beautiful, tiny petit-fours, i dare say! i hope you had a great valentines day, and beautiful blog! I'm so glad your computer is up and running again. I've missed the posts and photographs. This dessert looks so simple and elegant. I love it! What a perfect idea for Valentine's day. Thanks for sharing.